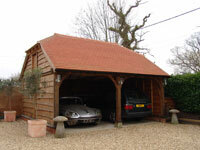 We pride ourselves on our Oak craft; which is to supply and build well designed, high quality traditionally constructed Oak Frame Garages, Oak barns and Outbuildings throughout the UK. We have a no-compromise approach to our buildings, which means we care about providing the best possible product and service to our clients. 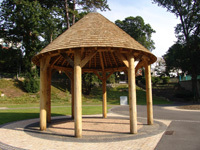 As a leading oak frame design company, we have gained from over 20 years of experience in a varied portfolio of oak frames and timber engineered structures. We are happy to undertake traditional or contemporary commissions for full oak framed buildings, larger oak framed extensions and also undertake restoration work on historic oak frames. We are always interested in designing and crafting oak framed structures, such as oak entrance porches, studios, cabins, summerhouses, garden rooms and retreats. We can offer a full design & building service or alternatively supply our oak frame ‘kits’ with detailed plans and instructions. Andrew Waller (RICS), Brockenhurst, Hampshire. Lynn & Tim Potter-Clark, Lymington, Hampshire. Our services unlike most oak frame companies covers managing the whole process from planning applications, through to completion; or simply supplying oak frame kits. At New Forest Oak Buildings, we care about the details, so you don’t have to. We simplify the whole process, by giving good advice from the outset and ensuring everything runs smoothly. We have an enviable reputation and strive to further build on that reputation with every successfully completed project. Our Oak frames look great as they are well designed, well detailed and well constructed; it’s that simple. New Forest Oak Buildings is a Hampshire family based business that provides specialist Oak frame solutions using primarily English Green Oak and other managed timber from sustainable sources. We design, supply and build throughout the UK and have been involved in oak framing for over 20 years. We have a wealth of experience in the design and construction of all oak framed buildings, with many oak garages, extensions and larger oak buildings designed and constructed over the last 20 years. 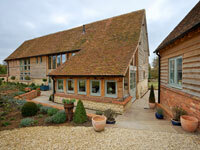 Whatever your need New Forest Oak Buildings builds long lasting value into every build or supply only oak frame kit. We can design, manage and build from initial concept to full completion, which means we take care of all the various trades; from foundations to roofing, so you don’t have to.